One reason that I LOVE where I live is that there are TONS of curb freebies, roadside finds, roadkill rescues, or whatever you want to call it. I joke that half of my house was found on the side of the road. Well, that’s only partly true but I really do find awesome things on the side of the road! During the warmer months here in New York, there are always good finds to be found! I snatched up this little desk as fast as I could when I passed it on my neighborhood street. Since the desk was free, I wanted to see how little I could spend to do the makeover for my sewing desk. My old sewing end table desk got a paint job and moved into the living room. First, I sanded it just a tad (mostly on the top) where the sewing machine would sit and where the most wear and tear would occur. Then, I wiped it down to remove any dust and debris from sanding. (1) Next, a sprayed it with a good coat of Kilz Spray Primer and Sealer that I had on hand. Again, mostly on the desk top. (2) After using spray primer, I like to take an old sanding sheet and rub the piece down to get rid of any gritty texture the primer may have left. 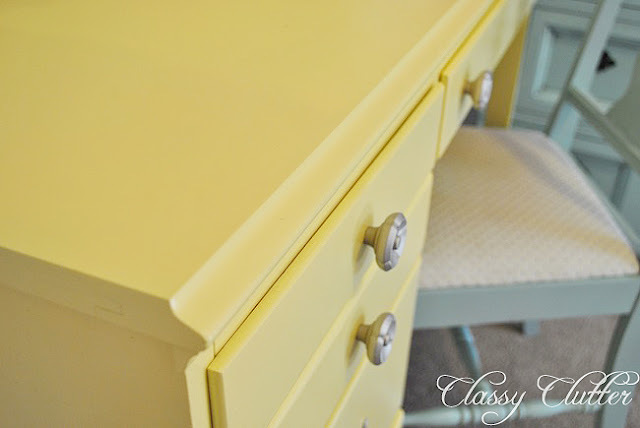 (3) Next, I mixed my own concoction of sunny yellow and white to create this gorgeous buttery yellow. I love the outcome of mixing colors. If you haven’t mixed paint colors before, it’s really fun! When you don’t have to be super picky on the color, its fun to experiment and use what you have since I didn’t really want to spend money on this project. (4) Last, it got a spray down with my HVLP spray gun. The desk was missing a knob so I swapped the knobs out for some I had in my stash from a dresser I did for a friend. I kept the original handles though and gave them a spray with Krylon’s metallic nickel. 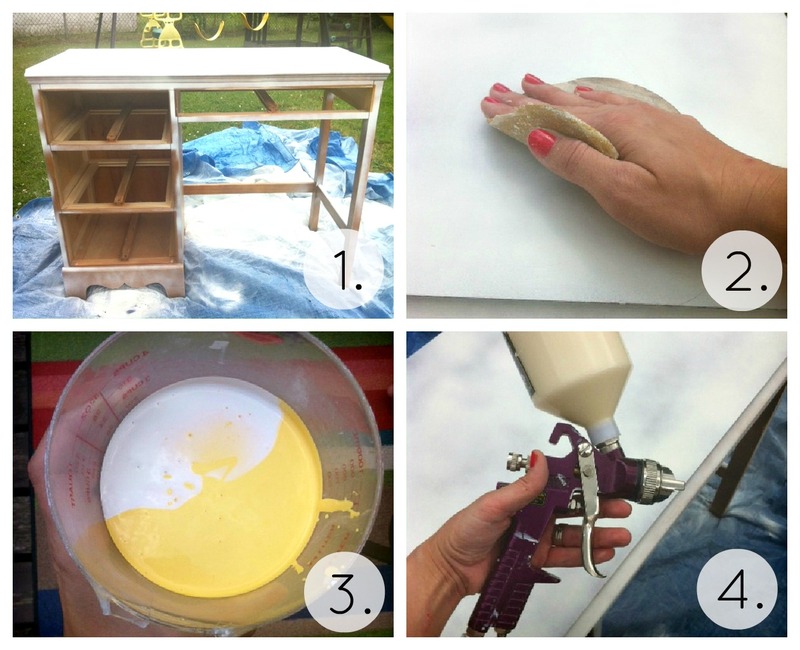 The hardware spray paint was the only thing I purchased for the makeover making my total $3.97! I added this contact paper I had under my kitchen sink and I think it makes it look so polished and “finished” looking! Not a bad project for less than $4 huh!? 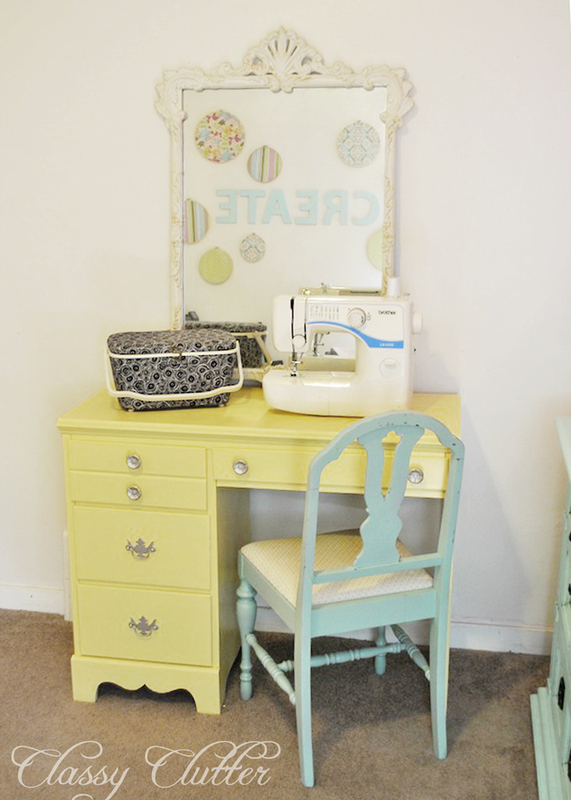 It is absolutely perfect for a little sewing desk and I love that I have more drawers to store all my notions, thread, etc. What do you think?! Have you found any freebies lately?? Follow us on Facebook here… and on pinterest here and here. Why don’t I find such goodies just laying on the side of the road?? I would love if you linked this beauty up to my party! That yellow is so pretty. What an amazing transformation. I have just recently started checking out your blog!! I love this project! We are getting ready to move, and then I am going to start my first adventure in furniture painting!!! Thanks for the tips I have gotten off this blog!! It looks so sweet! Love the color of the desk and chair! It’s so pretty in yellow. Why can’t I ever find some good free stuff? Love it! I always have my eyes open for a good roadside rescue…now my boys are even onto it! Latest grab…an office chair with arms and hydrolic lift and lower lever…SCORE!! Just wish I could make it as cute as your new desk. C-U-T-E! You know I clearly have a penchant for freebies! I need to get a paint sprayer though! 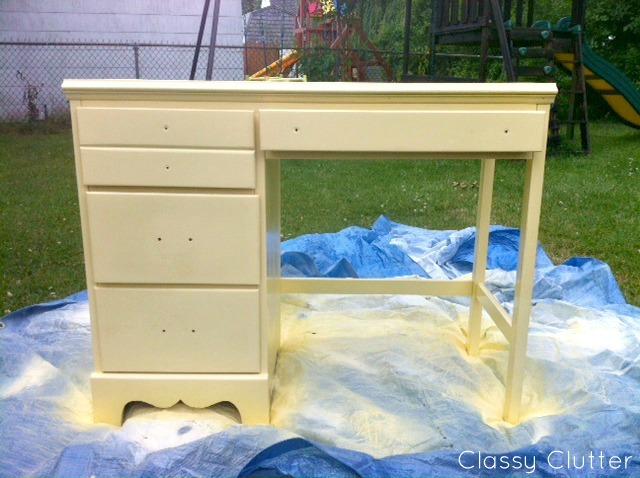 That would have been lovely to have as I redid my free dresser last weekend! LOVE the color. Great job. Soooooo cute! 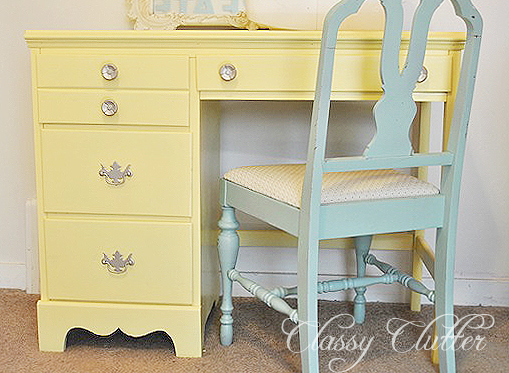 Love the yellow and the chair color, too! Never good stuff like that in my town. Lucky girl. 🙂 You did a beautiful job. Too cute, and free is always good! Love it! What brand of HVLP do you use? Do you like it? Is it easy to clean? I am thinking about buying one. I absolutely love the desk! I need to get one of those spray guns!! Wow! Love how it turned out. LOVE the yellow!! What a great little piece! The chair color with it makes it extra cheery! Great job! You couldn’t find this in a store. Beautiful color combo! Nice job! Hey-love this! Can I ask you 20 questions about your paint sprayer? 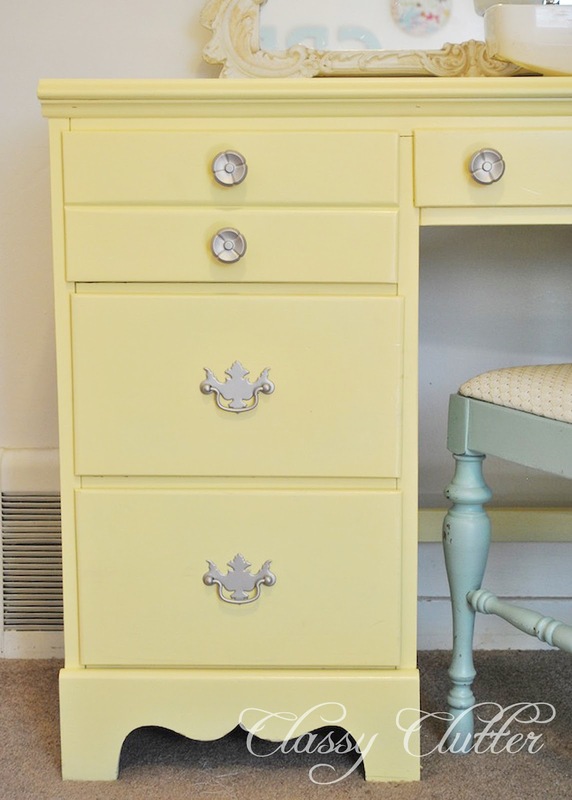 I have been brush painting furniture for years now and want to transition to a sprayer. What kind do you use? About how much do they cost? Did it take a lot of practice to learn to use to get even coats (no drips)? Can you use all kinds of paint with it? I’d love some tips and recommendations before I buy my sprayer. Thanks! Love the color, especially with the chair! 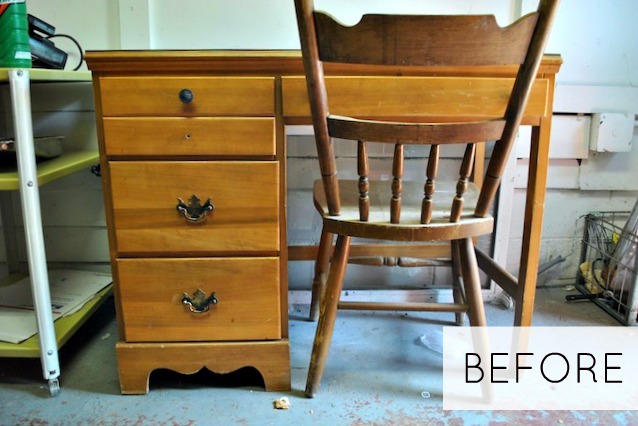 Great find and makeover!! Found you at Under the Table & Dreaming. I’m a new follower. so sweet! i love the soft color! I love the soft yellow and blue combo! 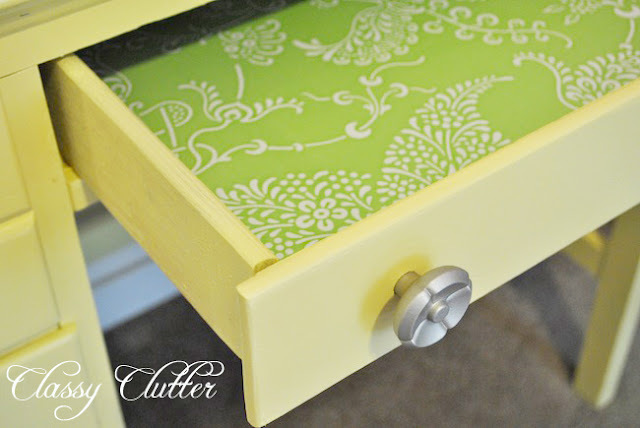 The drawer lining is also great. The yellow is the perfect color I’ve been looking for. Do you happen to remember the mfg. and if it is called sunny yellow? Also, do you remember the ratio of yellow to white? This blog is so old I hope you still check it. Anxiously awaiting your reply. Thank you. Where did you buy your spray gun?